Signalling or indicating when driving is a simple safety and courtesy task that many of us forget to do once we have obtained that all important full drivers licence and have a little experience behind us. Whether individuals simply forget to signal or they think it’s no longer important is an issue that can and frequently causes accidents. It’s for this reason that driving examiners are rather strict in regards to either the overuse or lack of signalling during a driving test. This section explains when to signal when driving and when not to signal. Useful for learner driver and experienced drivers. Listed are frequently asked questions by learner drivers and experienced drivers wishing to take the driving test. The following examples are what the driving examiner expects of a candidate during the practical driving test. Basically if anyone, even a pedestrian will benefit from seeing your signal, then the answer is yes. If there is no one around, then a signal is not necessary, although if you still decide to signal and no one will benefit, it has no consequences on the outcome of your driving test. Indicating when parking up essentially follow the same rules as when pulling away. If anyone will benefit, you must signal your intentions to park up. If no one will benefit, it is not necessary to indicate although you may still do if you wish. Deciding whether to indicate when overtaking a cyclist depends entirely on the situation. If for example you are driving and notice a cyclist ahead and there is oncoming traffic, it then depends on the width of the road. If the road is wide enough to overtake the cyclist safely, but may result in your car being positioned a little towards the centre of the road, a signal will benefit the oncoming traffic as it will show them your intentions of overtaking the cyclist. Similarly, you may have oncoming vehicles but the road isn’t wide enough to overtake a cyclists. In this situation, you likely need to reduce speed drastically. A right signal may be of benefit to any vehicles following you, especially if they may not have noticed the cyclists. Generally it is not necessary to indicate around parked cars. There can however be the occasional exception and again this is down to the particular situation. If for example you are traveling along a narrow road, a vehicle is behind you, up ahead are parked cars on your side of the road but you need to wait behind the parked vehicles to allow an oncoming vehicle to pass. In this situation due to the road being very narrow, the vehicle behind may not see the parked cars and when you stop, they may interpret this as you parking up. Indicating to the right in this situation would be safer as it will provide the vehicle behind with a clear indication of your intentions. Similarly to overtaking a cyclist, indicating around parked cars for the majority of the time is not required. Each situation must be assessed on a individual level and only signal if absolutely necessary. The passing parked cars tutorial provides further information. If intending to turn left or right on the approach to a roundabout, you must indicate in the direction you intend to take. If following the road straight at a roundabout, you should not indicate. If turning right or going straight, you must apply the left indicator just after the exit which is directly before the one you are taking. Upon leaving roundabouts, ensure all signals have terminated. See roundabouts for further help. No there is no need to signal during the turn in the road. If there is a vehicle, cyclist or pedestrian that may be affected by you performing this manoeuvre, you will need to wait until it is clear. Therefor there will never be a need to indicate. See turn in the road for further information on this driving test manoeuvre. As you are attempting this manoeuvre, you will drive a short distance past the left turn you intend on reversing into. Just as parking up, you may need to signal to other road users your intention of stopping the car. Generally elsewhere during the manoeuvre, there isn’t usually a need to signal. Read the in-depth tutorial on reverse around a corner for further help. During the driving test, the examiner will ask that you park up behind the vehicle that you will be parallel parking on. As this is essentially parking up on the left, you may need to signal to the left at this time as described above. Other than this, there shouldn’t be any other reason to indicate during this manoeuvre. Find out more about parallel parking / reverse parking. Whilst building up speed down a dual carriageway or motorway slip road, you should indicate to the right approximately half way down the slip road and once you have merged with traffic on the carriageway, cancel your signal. Whether on a motorway, dual carriageway or in a one-way-system in a city or town, you must indicate your intention to change lane if other vehicles are present. See change lanes for further help. Dual carriageways and motorways display markers in the form of 3 dashes (300 yards), 3 dashes (200 yards) and 1 dash (100 yards) from the exit junction. You must indicate at the 300 yard marker. See dual carriageway tutorial for further information. When driving in residential areas you should signal around 30 meters (100 feet) in advance of making a right or left turn. This is assuming there are no other turns on the same side of the road before the turn you intend on taking, else you will need to signal after this turn. For high speed roads this distance increases. 70 mph dual carriageways for instance, signalling should start from around 275 meters (900 feet) from your exit. 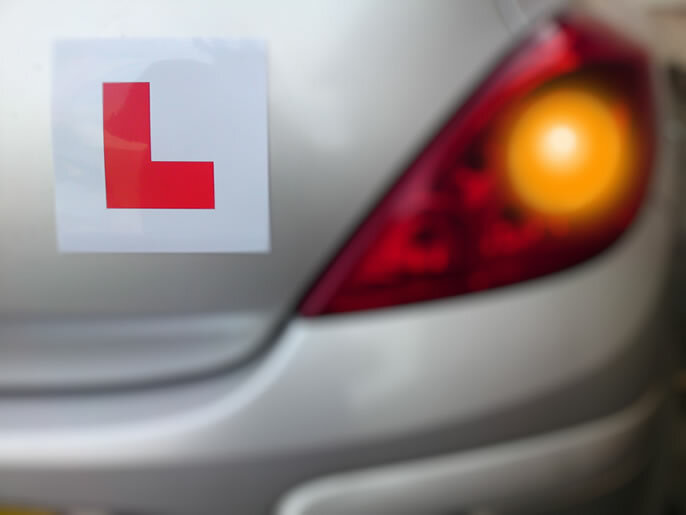 A surprising amount of driving tests are failed due to the overuse, lack of or incorrect use of signals. Even what might appear a minor issue such as forgetting to cancel a signal after exiting a roundabout can easily fail a driving test. Whilst learning to drive, there are times that a signal must be applied such as at junctions for example. Knowing when these times are along with the appropriate timings for applying signals is learnt reasonably easily with a driving instructor. There are other situations for the correct use of signals that can take some time to master for learner drivers as it requires the ability to read the road ahead, assess any given situation and to decide if a signal is necessary, such as passing cyclists for example. This guide on when to signal when driving should help learner drivers and also experienced drivers intending on taking the UK driving test to understand the correct use of signals. Whilst driving and during a driving test it is compulsory to indicate at junctions, roundabouts, left and right turns and whilst overtaking another moving vehicle. Other conditions may apply, all of which are explained in this section. Do You Have to Indicate if No One is Around? Put simply, yes! The simple fact of the matter is that you never know for sure if no one is around. You could be taking a left or right turn for example and a pedestrian who you didn’t see is about to cross the road at that junction. They would probably assume you’re not turning since you didn’t indicate. I had a debate with a friend about, If it is compulsory to indicate at round abouts or traffic lights if there is no other traffic around I.e cars, cyclist etc? That’s a good question. Most of the Highway Code is general advice, you tend to know the difference between a rule and advice by the way it written. So a rule would be ‘You must’ rather than ‘You should’. As such, there’s not a specific rule that states you must indicate at a roundabout whether there’s other traffic or not. However, it doesn’t mean that it’s not an offence. If an incident occurred due to a lack indicating, then it certainly wouldn’t do the driver any favours. Perhaps that pedestrian that you didn’t see decides to cross the road you’re turning into simply because you didn’t apply a signal? Indicating is as much to help those you cannot see just as much as those you can. You could for instance be looking at a penalty of ‘Driving without due care and attention or without reasonable consideration for other road users’ which will see 3 to 9 penalty points. Please visit the driving hand signals page for information. If your at a set of lights and in a lane that only allows you to turn left and you have no other option do you have to indicate? If you’re in a dedicated lane, then no, you do not need to indicate. When I want to join from the left lane to the right lane, when should I start to indicate? If I don’t think there is a safe gap to merge or there is a lot of cars on the left lane, should I just do nothing and keep on driving in the left lane? You only indicate once you have completed all safety observational checks and that you are certain it is safe to complete the manoeuvre. If it’s not safe to access the right lane, don’t indicate and stay in the left lane. If this is in reference to a driving test, then the examiner will alter the route accordingly. If you are on the independent section of the test, then it doesn’t matter if you go the wrong direction, just make sure you do it safely. Might as well remove the indicators altogether. No one uses them. Too lazy or can’t be bothered. The times I have waited at junction only to see a car turn off the road without any indication of their intention. I share your frustration Peter. It seems that common courtesy is becoming a thing of the past. I would do so on a driving test but it isn’t compulsory. When you do more advanced driving, such as in the Police, you are taught not to indicate if there is nobody around (when driving on blues lights you do signal however!!). If there is nobody that can benefit from your signal, there is no need to signal. That has to be the stupidest thing I’ve ever heard. What if you haven’t noticed another road user or pedestrian? The whole point of indicating is to let other people see what your intentions are, this is even more important if you don’t notice them, so you should always indicate! So, a signal is not obligatory and if used, it should be to advise others. If there is no one who would benefit from a signal, most advanced motorists would choose not to give one. I go further and consider the distance between another motorist and me. Can someone make use of the advice or am I just telling everyone what I am doing? I take the view that, if my move affects no one’s driving plan, I do not need to announce it. If my assessment of the speed and distance of other vehicles is accurate, my changing lane or turning in the road is obvious and it needs no fanfare. This is an opinion not shared by everyone, but I am an instructor and IAM examiner and I believe it can be persuasively argued. If you’re making a left turn for example and decide not to indicate because you see no one around. What about that pedestrian who you didn’t see and who decides to cross at the junction because you didn’t indicate? You could argue that your opinion is correct if every driver was trained to your level and maintained that skill through life. But in reality, would all drivers maintain that consistent level of observation whilst driving?